The U.S. Virgin Islands offers significant tax incentives to businesses in order to help boost its economy. “Qualified businesses are eligible for unique tax incentives including a reduction of up to 90% of personal and corporate income taxes and up to a 100% exemption on excise, business property, and gross receipt taxes,” according to the U.S. Virgin Islands Economic Development Authority’s website. As the U.S. Virgin Islands is a U.S. territory, these tax advantages are sanctioned by the U.S. government. The fact that the U.S. Virgin Islands is part of the U.S. Court System may make U.S. businesses more interested in forming a subsidiary in the U.S. Virgin Islands, rather than other off-shore centers like the British Virgin Islands or the Bahamas. While this article provides an overview of the basic requirements for incorporating or registering as a foreign corporation, a company interested in doing business in the U.S. Virgin Islands should consult with an attorney and/or tax advisor to determine whether it is in its best interest to form a subsidiary or simply register its company to do business there. In order to form a corporation in the U.S. Virgin Islands, the Articles of Incorporation must be drafted and filed. The Office of the Lieutenant Governor (the corporate registry on the islands) does not provide a standardized form for incorporation. 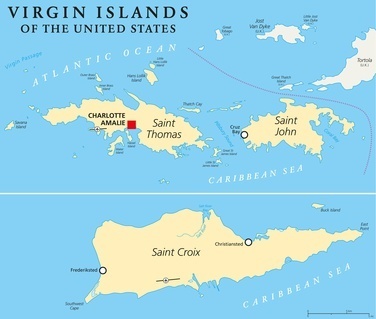 Unlike most U.S. states, the U.S. Virgin Islands requires a minimum of three directors, three officers, a president, treasurer and secretary. Corporate directors are not allowed. Stock must also be registered and there is a minimum capital requirement of $1,000. A corporation must also appoint a registered agent, who can accept any process served on the corporation in the U.S. Virgin Islands. Domestic Corporations - Corporations that are located and doing business in the U.S. Virgin Islands. These companies may be eligible for tax incentives if they meet specific criteria set by the U.S. Virgin Islands Economic Development Authority. Exempt Companies - These companies may not engage in the active conduct of trade or business in the U.S. Virgin Islands or the U.S. Additionally, individuals who are residents of either the U.S. or the U.S. Virgin Islands my not own 10% or more of the company. Upon filing an exempt company election, these companies are exempt from U.S. Virgin Islands income, gross receipts, withholding taxes and license requirements. Foreign Sales Corporations (FSCs) - These corporations were established by the U.S. Congress in 1984 and allow U.S. exporters to reduce their taxes on export income. There are more FSCs in the U.S. Virgin Islands than in any other country in the world. Companies that want to do business in the U.S. Virgin Islands, but do not want to incorporate, must file a “Certificate of Appointment of Process Agent and Sworn Statement” with the office of the Lieutenant Governor. In addition to appointing a registered agent, the corporation must provide a simple statement of its assets, liabilities and capital stock. The Certificate must be accompanied by a copy of the company’s Certificate of Incorporation and any amendments, a Certificate of Good Standing from its domestic jurisdiction and a signed consent of the registered agent agreeing to act in that capacity. Domestic corporations and registered foreign corporations must pay an annual franchise tax and provide supporting Financial Statements (general balance sheet and profit and loss statement). The financial statements do not become public record. This is due by June 30th of each year, including the year of registration or formation. The U.S. Virgin Islands offers several different choices to corporations, whether they are planning to do business on the island or they deem that the tax advantages offered by the exempt or foreign sales corporation structures will suit their needs. Although a U.S. territory, the requirements for both domestic and foreign corporations are somewhat different than those found in the states, so it is wise to ensure that these differing requirements are understood in advance.